An elegant leather strap with shaved and polished edges. This very plush strap offers the strength to hold any camera combined with the comfort to wear it. You will give thanks to the smooth crafted edges after a long day toting your heavy camera and lens around your neck. 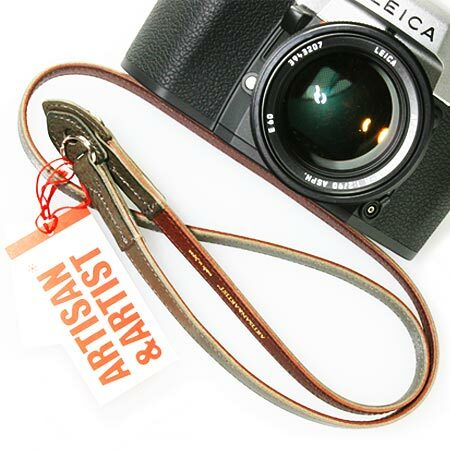 Fine stitching with doubled sandwich ends assures your camera will be suspended safely on this strap. The strap will also care for your camera's top plate with leather lug protectors which prevent the steel lug rings from contacting the plate at any time. The Kobe strap has a hand-turned pebbled grain, crafted by the classically trained artisans at A&A. The Kobe strap is available in Cognac Brown or Coal Black with cognac interior.